Available only at The Container Store, our White Elfa Shelf Basket rounds up wayward items like socks, hosiery, and accessories in the closet; produce in the pantry; or balls, skates, and bags of potting soil, charcoal or fertilizer in the garage. Mount them with White Elfa Ventilated Shelf Brackets. They can be joined to create larger storage areas. White Elfa Shelf Basket is rated 4.8 out of 5 by 43. Rated 5 out of 5 by aagarage from Neat Clean Looking and Easy To Install We've owned Elfa storage products for years and when we moved to a condo we had to leave our storage system behind. Bought the basket as part of a small garage storage area to get some started there. All the pieces were easy to install, very well made, and look great in the garage. I've since bought a larger system for the garage and complete new shelving for my personal closet. Love it and don't see anything readily available of this quality and appearance. Rated 5 out of 5 by puppymom from Not a better system! I've just finished my third Elfa project…and Iove it. We did our walk-in clothes closet, my laundry room closet and now my walk-in pantry….everything is organized, clean and I smile every time I stand and admire what Elfa offers. Rated 4 out of 5 by valelaine from Great addition to laundry room These work brilliantly. They are sturdy, and the basket form keeps things securely on the shelf. Rated 5 out of 5 by Cat10 from Perfect Elfa has worked out great in our laundry room!! Truly perfect for looks and organization! Rated 5 out of 5 by MAVA from Greatest Pantry - What a Dream! My pantry closet was a disaster. It had few shelves and that meant that cans, boxes of food, storage and serving items were piled on top of each other. A disaster when trying to find things. I had the Container store replace the shelving in my pantry with Elfa open shelves and shelf baskets. What a difference! I can now easily access everything; everything has a place; and the closet now holds more than it did previously, including paper products that were previously stored elsewhere. I still smile each time I open the door! Thank you for the excellent system, the great installer, and your design work! Rated 5 out of 5 by queenofelfa from Very cool with the dividers Installed these in master closet with lower rod beneath it. You can get the dividers to create compartments for those smaller items that don't stack well. They even have dividers with walnut accents to match the elfa decor shelf trim. See photo. Rated 5 out of 5 by DebbieC from Perfect Solution I bought this basket to organize socks & underwear in a walk in closet. Originally I designed this closet area for hanging, but with a simple purchase and a few minutes I changed hanging into divided storage. I love the elfa system. Rated 5 out of 5 by GKYoung from Lots of Options I have been an Elfa fan for several years but this is the first time I have purchased the shelf basket. I found many uses for it, and like the 'divider' (and end caps) options of clear plastic or decor. I purchased three of these baskets and each serves a different purpose: 1) small clear boxes containing jewelry sets; 2) shoes - specifically flip-flops; 3) desk stuff such as notecards and envelopes, small boxes, wallets. Additionally they were easy to install. Rated 4 out of 5 by quilter147 from Captive organization The shelf baskets work great for quilt projects I want to keep contained with limited access. I use them for projects I'm not repeatedly pulling off the shelf. Rated 5 out of 5 by pastelpoodle from Great Product! One more great thing that Elfa does! Very convenient and helpful to be able to keep hard to store items that might be better in a drawer on a shelf the closet when there is no where else to put them. Rated 5 out of 5 by Schubi from Great Storage solution great shelving option, good to store smaller / larger items without the risk of falling from shelfs when moving thngs around. Rated 5 out of 5 by TryingForOrganization from Best organization for pantry These shelves help to organize the kids snacks so they have lots of choices of healthy snacks by using the dividers. Our pantry looks nice and quickly find good choices. Rated 5 out of 5 by CSLove from Cannot live without! The Shelf Baskets are genius! We built a pantry closet under the stairs in our tiny (yet lovable) town home. We are super tight on space so we need to be creative. These baskets were a lifesaver. They hold so much more than a flat shelf would since you're not worried about things falling off the front or the back or the sides. I especially like that you can divide up your shelf easily. I am an organizational freak and this shelf is great. 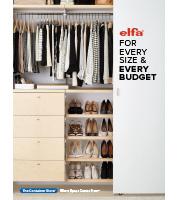 I also generally recommend the Elfa System and Container Store. The best is knowing that an employee is there to help you figure out exactly what you need and customize this seemingly stock system to fit your exact space and organizational needs. THANKS CONTAINER STORE!!!!! Rated 5 out of 5 by lmay27 from Basket Dividers Easy to install once you figure from back and top from bottom. Isolated sections well. Rated 5 out of 5 by OutsidetheBox from Unconventional Use I used the 2' long platinum shelf basket as a way to store cutting boards under our upper cabinets in the kitchen because they wouldn't fit anywhere else. The only complaint I have, and it's not even about the product itself, is that the Container Store doesn't have any sort of fastener that would be helpful. We ended up rigging something together which is okay unless someone looks at it directly from below. Rated 5 out of 5 by Woggie from The Miracle Of The Wire Freezer Basket The wire freezer baskets #10009010 saved me from an irate Mom who hates clutter, but most importantly, from the prospect of eating out of date or frost bitten food. My freezer was totally unorganized and the food rarely rotated for food safety and freshness, Items often would fall onto the floor upon opening the door. After installing the freezer baskets, i can find everything i need at a glance. All of the items are secure and i can easily see my inventory. The oldest frozen food is now eaten first saving me a lot of money by not having to throw out and replace what was freezer burned. The baskets were inexpensive, durable, and completely flexible for all types of frozen foods. Everything is now organized and safe. It is a miracle for the freezer! Rated 5 out of 5 by owen221 from Shelf Baskets Great, sturdy product. I bought these and modified them to be used in a wooden wall unit to hold DVD's, three across. Looks great and works really well, allowing storage of 3 times as many per shelf. Rated 4 out of 5 by SteckIIT from Great for spices and the small stuff Got this to corral spices for a kitchen cupboard, terrific purchase! Rated 5 out of 5 by GrammyK from elfa Shelf Basket is Great Helps contain dish towels, cloths, etc. Watch the online video to see how to install shelving correctly, it makes all the difference. Rated 5 out of 5 by Trixinator from Unexpected hit! When my closet designer suggested I added a shelf basket in place of a regular shelf (above some drawers), I was not very excited. I went along with it because it was an inexpensive piece and I knew I could swap it. But I couldn't imagine what I'd use it for... I'm now in the process of changing all the shelving across my lower hang to shelf baskets. They are SO nice! What would normally be wasted space between upper and lower hang/drawers/shoe racks now stores my belts, clutches/wristlets, ball caps, wraps and scarves. I even have a small section for my dog's sweaters. These baskets aren't as exciting as my drawers or gliding shoe storage. But in terms of making good use of dead space, they are the the smartest thing I (well, my designer) did. Rated 5 out of 5 by Metza from I love this product I use this in my laundry room to store various dryer sheets and detergents. Rated 5 out of 5 by bluemountainmama from Great addition to Elfa configurations I love these little baskets. The are nice and shallow so everything is easy to see. We used them for clothes, socks and undies in my kids closets. I like that they can be divided into any size compartments. It would be even better if they had sides without adding a divider to create a side. Rated 5 out of 5 by Melon from Great for the Garage These baskets (and dividers) keep everything in its place. Fabulous complement to my garage shelving unit. Rated 5 out of 5 by Anonymous from eliminate the need for dressers We live in a townhouse, so the space in my boys' bedroom is limited. When I organized their closet with the Elfa system I installed these shelf baskets instead of standard shelfs. These shelf baskets allowed me to remove their dresser from their room, which gave them more play space. Rated 5 out of 5 by ldbaustin from Great product The shelf basket was a great addition to my bathroom shelf system. It was the perfect Elfa product to contain all of the tipsy bottles that manage to collect in bathrooms. Rated 5 out of 5 by KellyConQueso from Convenience of a shelf without things rolling off I really love the shelf baskets. I can stack my roly-poly items without fearing they'll fall off the shelf. Rated 5 out of 5 by amaryllis from Useful alternative to shelves I found the shelf basket useful for items that are rolled up (like rugs) or items that tend to roll (like baseballs and basketballs)! Can the shelf baskets be cut to a custom length? Yes. It follows the same guidelines as the regular ventilated shelf. Can the Walnut elfa d&eacute;cor Fascia be put onto this? Would it be possible to put the Walnut elfa d&eacute;cor Fascia on this? If so how because it doesn't specify in the directions. They have updated the product line and fascia can be mounted to the shelf baskets now. Can these be cut to smaller lengths? Our elfa shelf baskets cannot be custom cut, but our elfa ventilated shelves can be custom cut. We do not have a weight capacity listed for our elfa products as the weight capacity varies depending on how the product is mounted, weight distribution, and the contents being stored. If you would like assistance in determiming if this solution is right for you, please call us at 1-800-733-3532, or email us at contain@containerstore.com with additional details regarding what you are looking to store on the shelf. Can you hang a closet rod from a shelf? I can't see exactly what sort of bracket the shelf basket gets, but I am wondering if the closet rod support is compatible with the 12&quot; or 16&quot; shelf basket. Yes,our elfa Closet Rod Holders are compatible with the elfa Ventilated Shelf Brackets that support our elfa Ventilated Shelf Baskets. What is the standard spacing between baskets? Our elfa Shelf Baskets can be as little as 1&quot; apart, but the most common spacing is about 6&quot; for access to the contents of the lower Basket. Our shelf baskets only come in a 12&quot; or a 16&quot; depth, not a 20&quot; depth. Do the translucent liners fit these baskets? They do! If you need a custom-fit, you can cut the liners with regular scissors.